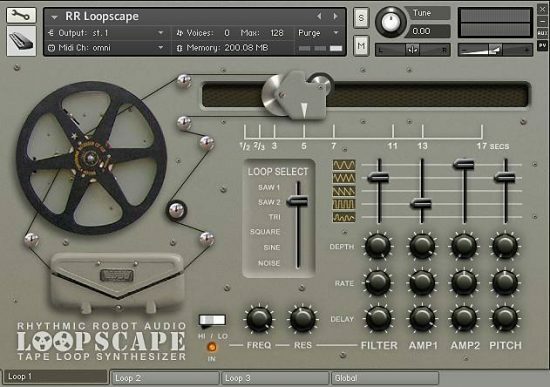 A timewarped, battered, erratic soundscape machine! 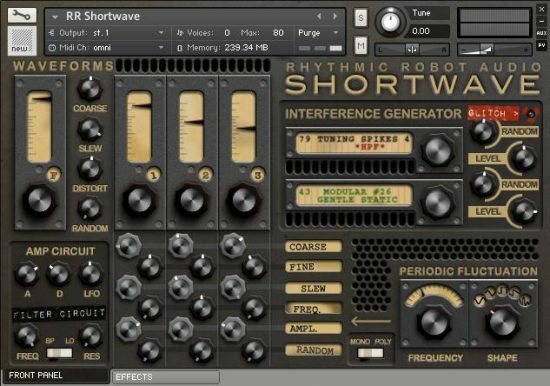 We’re big fans of tonewheel organs here in the lab – there’s something about that classic electromechanical swirl that just gets us in our gut – but our single biggest complaint about the otherwise great emulations currently on the market is that they all sound a bit clean. We always end up going to significant amounts of effort to get some real dirt and warmth going, and even then, sometimes the results aren’t as grungy as we’d like. Real tonewheel machines have history; they have a past; sometimes that past is pretty sordid and grimy. 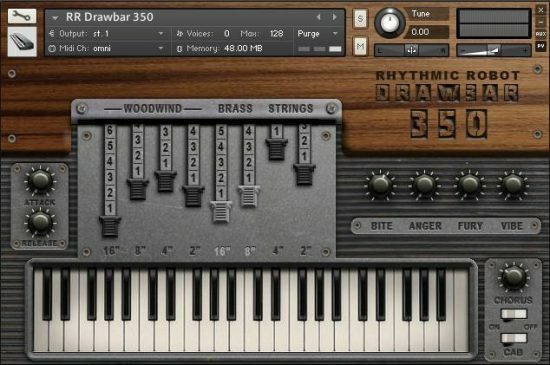 So why do the organ sims sound so shiny and new? What we need is organs with a bit of character. FadeWheel takes that mission and runs with it. 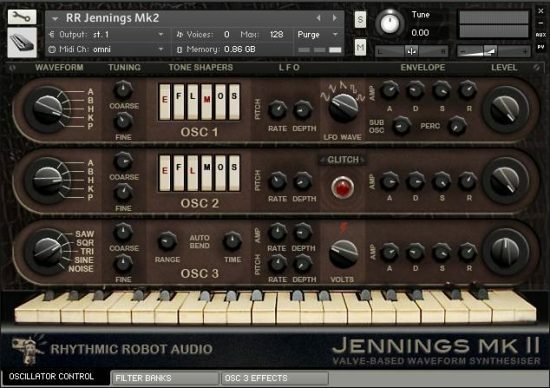 At its heart is a simple but versatile three-waveform organ engine, with two Hammond B3-type dials and a Vox dial. We chose these very carefully so that combining them yields a surprisingly wide spectrum of sounds. B3 1 gets you a pure, simple, fundamental-only B3 tone (based on an 808000 patch, for Hammondheads among you). B3 2 adds some nice harmonic overtones courtesy of the last three drawbars. And Vox is really fun: this is where you go for upper harmonic content, and pushing it can get pretty dissonant if you want. Plus, its transistor tone complements the tonewheel dials nicely. Keeping Crosstalk, X-mod and Failure at somewhere between 7am and 11am on their dials adds subtle but convincing ‘age’ to whatever tone you dial up with the waveform dials – you can vary the precise flavour of this dependent on which controls you push further. But at anything past 12 o’clock, you start to get really noticeable amounts of dirt and grunge colouring your waveform, and can take the whole deal into sound-design territory. In fact, it’s perfectly possible to create and play patches on FadeWheel using only the three ‘grunge’ controls, and leave the main waveform dials all set to zero! To the right of the panel are some vital sculpting options. Attack and Decay knobs let you create swelling patches that trail away into dust and crackles; Voltage allows you to generate some harmonic distortion; Chorus adds some lovely stereophony and shimmer; there’s a Tremolo modulator for movement; and carefully-chosen Hi-Pass and Low-Pass filters let you tame the harmonics or smooth away the low-end. Use these together and you can get a band-pass, frequency-limited sound that is very typical of early recording apparatus: put that through the Amp Cab simulator and you’ve got yourself an early shellac 78 ready to play 😀 We have, of course, included the absolute necessity of a rotary speaker sim (the Circulator) but twinned it with a neat Echolator to give you some tape-echo-style options as well. An output compressor holds the whole thing together. Bring it on! If you need to inject a Jon Lord / Deep Purple feel into your music, or are trying to get that Boston “Foreplay/Long Time” thing going on, these organ tones sound like they’re being played through a heavily overdriven Marshall stack on fire. Most of the other Hammond-alike sample libraries I have are a little too “well-behaved”, shall we say. There’s nothing of the rock and roll animal about them. This sample library has the capacity to grab the listener by the balls and demand that they pay attention. It’s the dog’s. 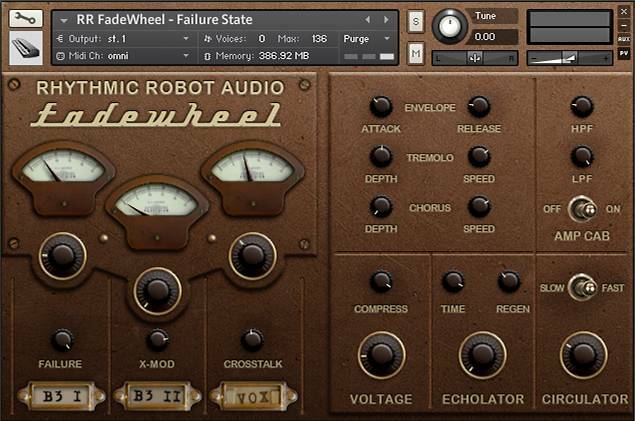 Fadewheel has a terrific set of samples combined with a clever interface. Many software organs out there have no guts and no quirks. This one has plenty of both for a very reasonable price. My only two suggestions would be to add an onboard reverb level and the invaluable “glitch” to the interface and increase the price slightly to reflect your extra time (probably requires a second page). One can program the sounds yourself fairly easily but it is always a joy to “throw the dice” with “glitch” and get something you never would have built from scratch. Reverb is always helpful when creating pads or dusty organs. Great instrument. There’s something about the gritty organ sounds that just fit nicely into the mix. Highly recommended. Sometimes you must get your organs dirty if you want to partake in the full glory of the tone banquet. I Love This! So dirty!!! The simple interface makes it easy to dial in just the right amount of angst. This is will likely be a go-to B3. Sweet & Nasty! Finally a Hammond with depth and character for anything from straight up dirty rock sounds to ambient pads and more. Badass! This is my favorite Hammond emu that I own. All the sounds are eminently usable. I only wish the cabinet & Leslie was standalone so I could run my guitar thru it. Ohhh This is lovely. Rough Rugged Wrecked and Raucous(Cous). Yummy. I’d wager I can hear a bawk of Telecaster amongst the valvesome goodness. Sounds untold.